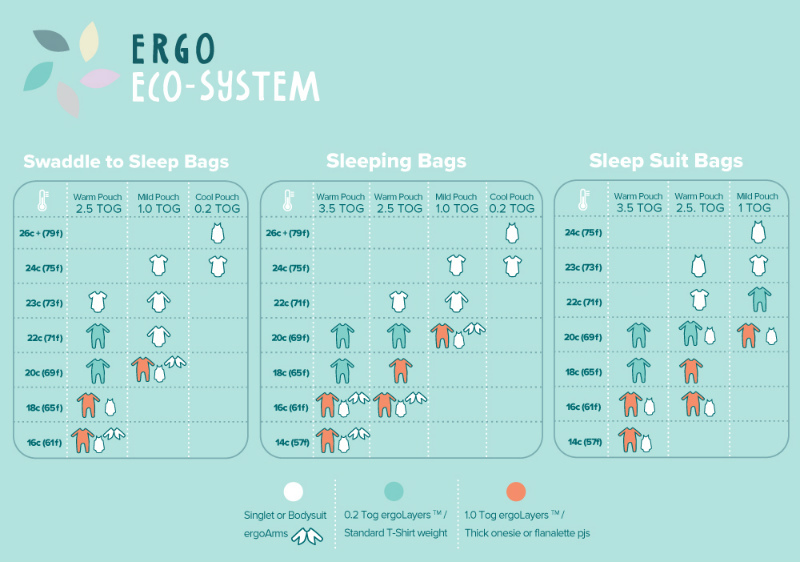 ErgoPouch’s new ergoEco-System takes the guesswork out of dressing baby for bed – and promises a better night’s sleep for everyone at your place. Days are getting chillier, night is falling earlier and parents across the country are shivering a tiny bit – and trying to remember how to keep their babies as cosy as possible as winter approaches. Fortunately, ergoPouch has come to the rescue, with a brand new foolproof system for dressing little ones at night in the cooler months. Comfortable cleverness is top-of-mind with their gorgeous new ergoLayers sleepwear range. Not only is it extra soft, it’s made with breathable bamboo and organic cotton fabrics, ensuring your baby is both cosy and comfortable. This range isn’t only built for those chilly nights. The all-natural fibres in ergoLayers will cleverly moderate your baby’s temperature through all kinds of weather. Your bub will stay cool on warm nights and perfectly snuggly when the temperature drops. Our favourite benefit of this built-for-comfort baby wear – apart from the adorable prints – is the fact that it promises a better night of sleep for everyone! The ergoLayers sleepwear is just one part of the innovative ergoEco-System, designed to work together to take the guesswork out of dressing your baby for bedtime. The ergoLayers range comes in two Tog (warmth) ratings. The 0.2 Tog garments are for warmer nights and 1.0 Tog garments are for cooler weather. The ergoLayers sleepwear also has two way zippers for hassle free nappy changing, as well as fold over foot cuffs and mittens on smaller sizes – adding extra warmth for newborn babies. The ergoLayers are available in sizes 0-3 months, 3-6 months, 6-12 months, size 1 and size 2. The range retails for a RRP of $34.95 for the lighter-weight 0.2 Tog garments and $39.95 for the cosier 1.0 Tog items in the range. The sleepwear can be mixed and matched and worn alone, or used underneath the award winning range of ergoCocoons, Sleep Bags and Sleep Suit Bags. Check out the full range and purchase directly from ergoPouch.